This holiday, Mickey Mouse game Epic Mickey is tapping into 80 years of Disney history to set a new tone and direction for everybody's favorite mouse, Mickey. The game allows players to dynamically change the game world...to save it. Players can use paint to create and paint thinner to erase. By using paint, enemies can be changed to friends, while thinner defeats them. Epic Mickey features cameos from Disney characters — as well as spots from the Disney theme parks like the Robinson Tree House and the Tiki Room. Stages, like the Steamboat Willie one, draw from Disney history. 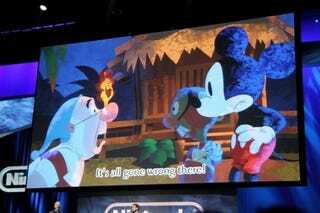 Epic Mickey will be released exclusively on the Nintendo Wii later this year.